MANILA, Philippines - 'Bagyong Agaton' is now over Southern Negros Oriental, state weather bureau PAGASA announced in its 8:30 a.m. update on Tuesday, January 2, 2018. 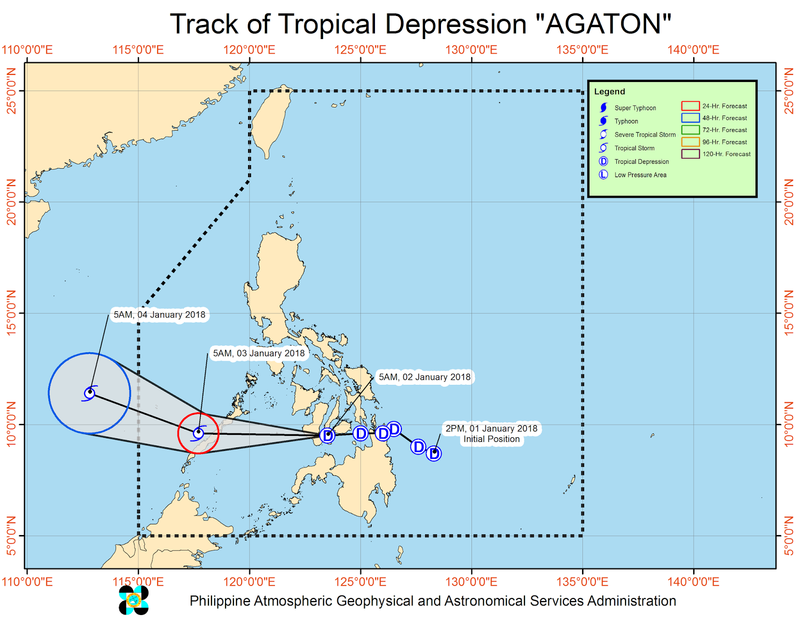 At 8:00 a.m. today, the center of Tropical Depression 'Agaton' was estimated based on all available data at In the vicinity of Bais City, Negros Oriental (09.6 °N, 123.1 °E). 'Bagyong Agaton' has maximum sustained winds of 55 kph near the center and gustiness of up to 90 kph. It is forecast to move West at 25 kph. Tropical cyclone warning signal No. 1 (30-60 kph expected in 36 hrs) has been raised in 9 areas: Palawan including Cuyo Island in Luzon and Bohol, Cebu, Siquijor, Guimaras, Negros Oriental, Negros Occidental, Southern Antique and Southern Iloilo in Visayas. Scattered to widespead moderate to heavy rains is expected over Visayas, Misamis Occidental, Dipolog City, Northern Zamboanga del Norte and Palawan. Residents of these areas must undertake precauitionary measures against possible flooding and landslides and coordinate with their respective local disaster risk reduction and management. Sea travel is risky over the areas under TCWS #1 and seaboards of Northern Luzon and Southern Luzon, eastern seaboard of Central Luzon, and eastern and western seaboard of Visayas and eastern seaboard of Mindanao due to the surge of the Northeast Monsoon and TD MINDANAO.